Poet; lived at the beginning of the thirteenth century. Although Jedaiah Bedersi, in his "Iggeret Hitnaẓẓelut," classes Meshullam among the Provençal poets, Meshullam's native country seems to have been Spain. According to Gross ("Gallia Judaica," p. 146), the name of the place , which is added to Meshullam's name in a Bodleian manuscript (Neubauer, "Cat. Bodl. Hebr. MSS." No. 1970, fol. 201), is to be corrected to (= "Da Piera"). In a Florence manuscript Meshullam is designated as "En Vidas de Gerona." Meshullam ranged himself with the Orthodox in their struggle against the philosophers. He directed his attacks chiefly against the translator of that work, Judah al-Ḥarizi, and wrote several satirical poems on the "Moreh Nebukim." These poems have been published by Steinschneider in the "Sammelband Kleiner Beiträge aus Handschriften" (i. 3). 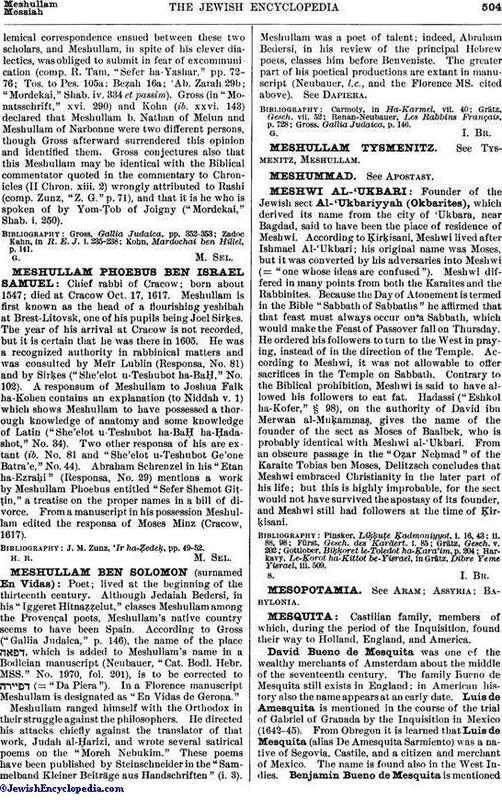 Meshullam was a poet of talent; indeed, Abraham Bedersi, in his review of the principal Hebrew poets, classes him before Benveniste. The greater part of his poetical productions are extant in manuscript (Neubauer, l.c., and the Florence MS. cited above). See Dapiera. Gross, Gallia Judaica, p. 146.